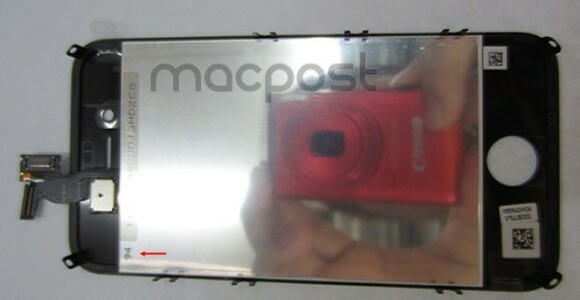 iPhone front panel leaks, is it from a 4S or 5? Welcome to the latest next-gen iPhone rumor roundup. This time we get a glimpse of a front plate (and other stuff too) that looks almost identical to the one used in the current iPhone 4. The plate belongs to the N94 prototype, which reportedly looks just like the current iPhone 4 but has a dual-core A5 chip inside - hence the 4S moniker. The front plate has EVT1 posted on it, which translates as Engineering Verification Testing 1 and has a March 03rd, 2011 date stamped on as well. According to DigiTimes.com sources the next generation iPhone will have a sub-4"display and it will drop the glass back panel design and go with metal (probably aluminum to save on weight). The same sources claim that the 4.0-4.2" rumor is more of a market-assumption than real fact. The display of the iPhone 5 (or 4S) will probably offer a slightly edged-out bezel but still be no more than 3.5-3.7 inches. Back to the front panel that leaked - it looks so similar to the one on the iPhone 4 that it could end up being the new lower-cost iPhone 4 8GB that should emerge as soon as the next iPhone hits the shelves. Also some rumors point out that the 4S will come out alongside the 5, sporting a dual-core chip and nothing more. The iPhone 5 on the other hand will offer a faster processor, an 8MP snapper, larger display and maybe a redesigned body. We won't be betting on two iPhone announcement this September (or October). UBREAKIFIX.com has leaked a couple of images of components, they claim to belong to the iPhone 5 - including a larger-looking camera sensor, slightly larger-capacity battery and different-looking earpiece speaker than the iPhone 4's. It's all a big mess of a rumor and it's already hard to keep up and choose who to trust. But the truth is probably hiding somewhere in there and they are almost impossible to be all wrong. With a little bit of luck, we'll learn the whole truth in a week or so (September 6th is the rumored announcement date).